The Tweed Project is a collaboration between some of Scotland and England’s most in-demand explorers of their respective country’s folk traditions. After a successful year of performances in 2015, the project has been reborn with a new line-up for 2019. The aim of the project is to find common ground between the Scottish and English folk tradition- two cultures which live extremely separate lives despite sharing so many similarities. With Greg, Ciaran and Evan hailing from England and Josie, Pablo and Ali hailing from Scotland, The Tweed Project will explore each member’s understanding of ‘home’ and the traditions that come with that thought. The band will be interpreting songs from each country’s traditional collections, as well as some contemporary compositions. 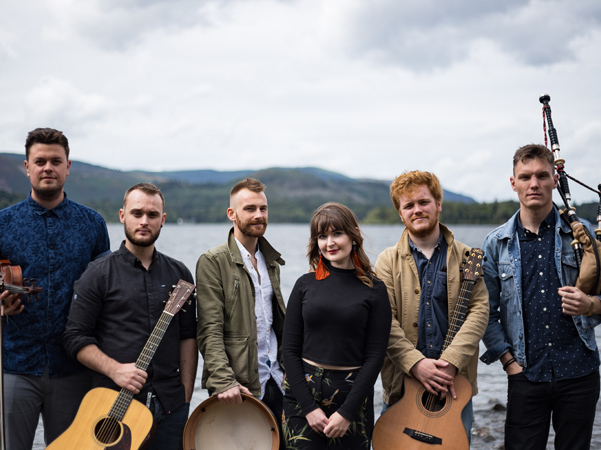 The Tweed Project are- Greg Russell (Vocals/Guitar/Bouzouki), Josie Duncan (Vocals), Ciaran Algar (Fiddle), Pablo Lafuente (Guitar), Evan Carson (Percussion) and Ali Levack (Whistles/Pipes). The Tweed Project is made up of members of some of the UK’s most successful folk acts. Two time BBC Radio 2 Folk Award winners Greg Russell and Ciaran Algar released their fourth duo album this year and have been involved in other huge projects and bands including The Transports, Shake the Chains (Greg) and Sam Kelly and the Lost Boys (Ciaran). Ciaran's fellow Lost Boys bandmate Evan Carson joins the project next year and is one of the most in-demand drummers on the UK Folk scene and also plays with Russian prog-rock band 'Iamthemorning'. He will also be releasing a solo project later this year. Scottish duo Josie Duncan and Pablo Lafuente have had a huge year since winning the BBC Radio 2 Young Folk Award in 2017 and they released their debut album at Celtic Connections in January. Ali Levack will be returning to the The Tweed Project for 2019. Ali is one of the most respected young pipe and whistle players in Scotland and won the Young Folk Award with the Mischa Macpherson Trio in 2014. He also performs alongside Pablo as part of Project Smok.